The BMRI is a new, innovative and independent research institute which aims to carry out a range of activities about the Muslim history, culture and heritage of Bangladesh and West Bengal. And in so doing it hopes to improve communication, remove misconceptions and promote knowledge, understanding and awareness of Bengal's Muslim history, culture and heritage. 1. Facilitate research activities, organise regular seminars and annual conference to raise awareness and promote understanding of Muslim history, culture and heritage of Bangladesh and West Bengal for the benefit of all Bengal's Muslims. 2. Create a website to provide up-to-date and comprehensive information about Bengal's Muslim history, culture and heritage. 3. Publish books, research papers, e-newsletter, or produce DVDs in order to achieve the above aim and objectives. 4. Organise seminars, conferences and workshop on Bengal's Muslim history, culture and heritage aimed at the new generation of Bengal's Muslims living in the West and in Bangladesh and West Bengal. Book Release Date Now Fixed! 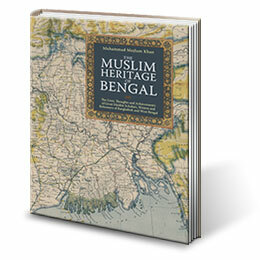 "Muslim Heritage of Bengal": Pre-order on Amazon here> Release date set for June 2013. Bengali, Muslim or British? Exploring our Heritage – 10 December 2011, at 4:30pm - 6:30pm. Venue Guildhall College, New Road, London. Please contact BMRI for further details. Muslim Reformers of Bengal – 15 October 2011, at 5:30pm. Venue Guildhall College, New Road, London. Please contact BMRI for further details. Launch of BMRI website – May 2011 in London, exact date, venue and time TBA. Please contact BMRI for further details. Exploring the Muslim Heritage of Bengal – June 2011, exact date, venue and time TBA. Please contact BMRI for further details. Launch of Bengal Muslim Research Institute Venue: London Muslim Centre (LMC), 22 May 2010. Islam in Bengal: Life and Works of Shah Jalal and Khan Jahan Ali Venue: London Muslim Centre (LMC), 2 October 2010. Muslim Rule in Bengal, 1204-1757, Venue: Ideas Store in East London, 4 October 2010. Islamic History of Bengal: Beginning to Present (one-day course), Birkbeck College, University of London, 13 November 2010. BMRI Seminar and Fundraising Event GAT in East London 27 February 2011. Islamic History, Culture and Heritage of Bengal: An Overview, Barking College, Essex, 17 April 2011. Islam in Bengal: Introduction to the Lives and Works of Muhammad Bakhtiyar Khalji, Jalal al-Din Tabrizi, Shah Jalal and Khan Jahan Ali, Brady Arts Centre, Hanbury Street, London, 24 April 2011.